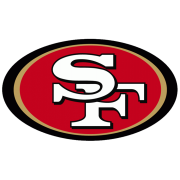 Starting Wednesday, as veterans and rookies arrive in Santa Clara, the San Francisco 49ers are set to begin training camp for the 2018 season — the second of the Kyle Shanahan era. But this year will be unlike its predecessor. 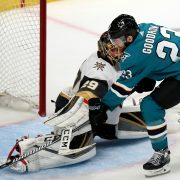 Entering his sophomore season as a head coach, Shanahan, along with the rest of his coaching staff, will be afforded more stability compared to 2017 with an entire year of experience under their belts and some building blocks locked in for the immediate future. 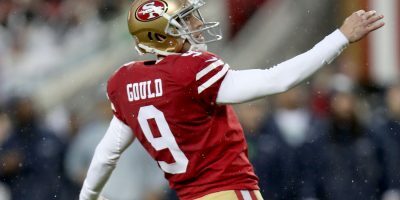 Now with a bona fide franchise quarterback in Jimmy Garoppolo under contract, a defensive leader in Richard Sherman added to the roster and a few other reinforcing draft picks and free agent acquisitions primed to contribute, the 49ers look like a team to be reckoned with in 2018 — at least on paper. While these improvements provoke optimism there are still some questions to be answered over the next five-and-a-half weeks. With that in mind, here are five things to pay attention to during 49ers training camp. How does Garoppolo perform after securing the bag? With a brand-new contract signed (5-years for $137 million), Garoppolo will encounter a career first: entering training camp as a starter. In every previous camp attended over the course of his four-year professional career, (all in New England) Garoppolo sat behind his former Patriot teammate Tom Brady on the depth chart. This meant that most of the reps taken in practice were with second if not third-team players. 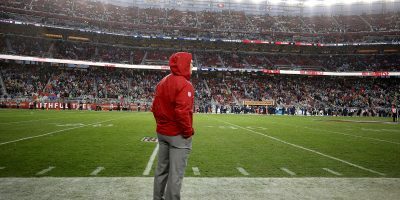 Now that he has taken on the role of franchise quarterback in San Francisco, Garoppolo will enter uncharted waters by absorbing nearly all of the projected first-team snaps. How he will handle the workload and pressure isn’t clear. What we do know is that during OTAs, which took place earlier in the summer, Garoppolo looked a bit off. While this can be attributed being somewhat rusty, it’s only natural to wonder if the shakiness will carry over to training camp. The good news for Garoppolo is that since he’s played more than a few games in Shanahan’s offensive system, training camp will allow him more time to absorb the playbook. Last season, Garoppolo compared getting acquainted with the 49ers playbook to “learning another language.” If that was truly the case, Garoppolo should be fluent in “Shananese” by the time Week 1 rolls around. Can Richard Sherman return to All-Pro form? It’s been nearly 10 months since the former Seahawks All-Pro cornerback has seen in-game action, after tearing his right Achilles tendon on Nov. 9, 2017. Since then, much has changed for former member of the “Legion of Boom,” a nickname given to the ferocious defensive backfield in Seattle . 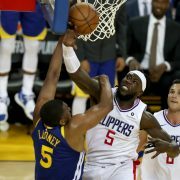 Along with getting married in March of this year, one of those changes included joining a once heated rival in the 49ers. Sherman has been regarded as one of, if not the, best corners in the league over the past six years but the four-time All-Pro will face a challenge unlike anything he’s seen so far: returning to that same level, a tall order for the 30-year old. Lower body injuries can be a death sentence for players who rely on their speed and athleticism, like Sherman. So can he answer the bell and become the player he once was only a year ago? If situational context has anything to do with it, the answer should be yes. Sherman is joining a defense that was derived from Seattle’s system. This is thanks to defensive coordinator Robert Saleh, who spent three years as an assistant in Seattle. Saleh even contributed to the 2013 Seahawks defense that helped the franchise win their first title ever. With scheme not really a factor, Sherman’s success will solely be based on his ability to bounce back from the ruptured Achilles from a physical standpoint. If he can regain his speed and mobility, which has been known to drive NFL receivers nuts (just ask Michael Crabtree), San Francisco has a great chance to improve a defensive unit that gave up the 11th-most yards through the air in 2017-18 (3,764). How does the depth chart shake out at running back? Former 49ers running back Carlos Hyde was once thought to be the long-term replacement for future Hall-of-Famer Frank Gore. Clearly, that is no longer the case. With Hyde now in Cleveland, the logical question to ask is, who will step into the essential role of running back? Well, considering Shanahan’s track record, there could be several answers. Being that Shanahan likes to utilize several ball carriers cover the course of a game, the most likely solution to Hyde’s departure will be playing the position of running back by committee. In other words, snaps will be distributed between two or three players. The big names here are Jerick McKinnon, Matt Breida, Raheem Mostert and Joe Williams, each of whom possess different skill-sets. In the case of McKinnon, the former Minnesota Viking will have a chance to become the featured back in this system. First and third downs will be his bread and butter due to his ability to catch passes out of the back field. In 2017 alone, McKinnon caught a total of 51 passes for 421 yards giving him 570 yards from scrimmage. 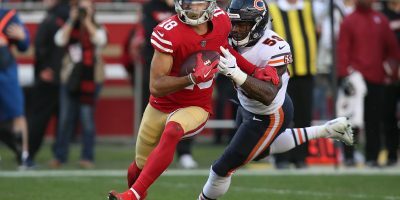 Since Shanahan has shown that he likes to incorporate actions like running back screens and wheel routes, McKinnon should fit into that role well. For Breida, he showed the organization last season that he could carry his weight even during his rookie year. Taking advantage of 102 touches in 2017, Breida will have the luxury of having an entire year in the Shanahan system as opposed to this being McKinnon’s first. Breida racked up nearly 500 yards on the ground last years as well as 180 yards through the air. If Breida can make some noise during camp, it’s not out of the realm of possibility he sees roughly the same number of touches as McKinnon. On the other hand, a lackluster camp could relegate him to a distant second-place position on the depth chart. That standing could be even worse if Williams has a breakout camp. In Williams’ situation, a red-shirt rookie season could prove to be beneficial after having an injury-riddled camp last summer that left him on injury reserve. Williams will likely be fighting for that coveted third running back spot along with Mostert, who saw snaps on special teams last year. What do the 49ers do a at Mike linebacker? 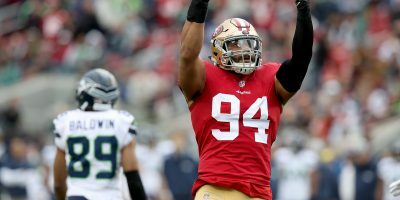 When it comes to the issue of middle (or Mike) linebacker for the 49ers, there is both bad news and good news. 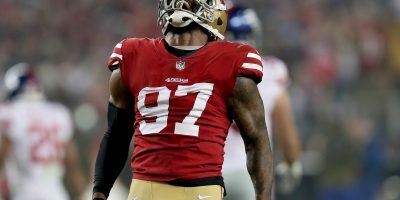 The bad news: Second year linebacker Reuben Foster will be serving a two-game suspension for violating the league’s conduct policies. The good news: He can participate in all activities during training camp. Life without Foster won’t be too long in duration but his anticipated absence for Weeks 1 and 2 of the regular season will require other players to get first team reps in order to be competitive in both games. Foster will no-doubt be on the field during camp but who will step into his shoes as a placeholder at starter until his eligibility is reinstated? For now, it looks like Brock Coyle, barring any injuries or other setbacks to his labrum recovery. Coyle is coming off of labrum surgery that repaired his shoulder in January. He did not participate in OTAs but is expected to be fully cleared by Wednesday. In 2017, Coyle stepped into the role of Mike linebacker as Foster nursed lingering shoulder and ankle injuries. In fact, Coyle started a total of 10 games in 2017. The other option, assuming he shows the ability to perform at the pro-level, will be Fred Warner who was drafted in the third round by San Francisco in May. Warner, out of BYU, will fit in as a weak-side linebacker but that position will likely be filled by Malcolm Smith. Smith missed the entirety of the 2017 after tearing a pectoral muscle during a scrimmage at Levi’s Stadium last offseason. Who emerges as front-runner at right guard? As mentioned before, the 49ers will have a new $137 million toy in Garoppolo this year. Since wrapping him in bubble wrap isn’t really an option, protecting Garoppolo will be of incredible importance. While the unit did improve last year in comparison to their atrocious output in 2016, there is still a hole on the line that must be addressed if they hope to keep their quarterback out of the hospital. 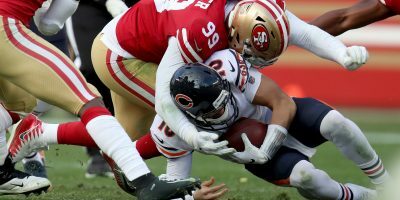 So far, both tackle positions are covered by Joe Staley and rookie Mike McGlinchey. Center and left guard are solid with Weston Richburg and Laken Tomlinson respectively, who are both savvy veterans at their positions. This leaves the issue of who will suit up to play right guard. The most competitive battle will likely be between Joshua Garnett and Jonathan Cooper. After starting 11 games as a rookie in 2016, Garnett was expected to become the team’s go-to-guy at guard in 2017 but the injury bug had other ideas. Garnett spent the entire 2017 season on injury reserve after sustaining a left knee injury during last year’s training camp. If he can bounce back, he has the chance to return to starting form. Cooper, 28, started a career-high, 13 games for the Dallas Cowboys in 2017 and signed a one-year deal to land in San Francisco. According to ProFootballFocus.com, Dallas had the fourth-best offensive line last season thanks in part to Cooper’s play.